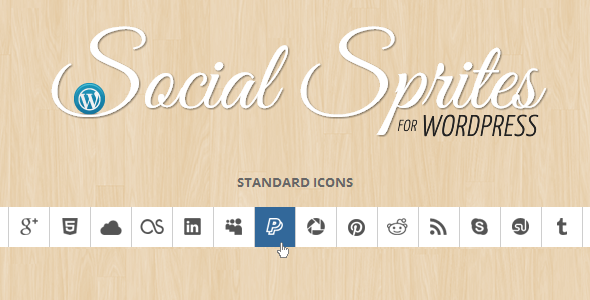 Social Sprites Icons is a set of commonly used social icons that transition using CSS ease. This set is super lightweight and could easily be integrated into any website. There are two versions for the icons. One is the standard icon set, and the other is a mini set. On hover, the icons background color will change to the official color of the social network. All of the icons are in one sprite png that totals 26.1 KB. Social Sprite Icons installed on SmartStart Theme. Each themes come with its own customization for the sidebar and widgets. One of the most popular and heavily customized tag is .widget. Since each theme is styled differently, we cannot predict what preset will affect our buttons. With this in mind, we decided to take a different approach. Instead of attempting to reset the .widgets class, we prioritized our sprites list instead. Therefore, all of our lines of code in the stylesheet has ”!important” callout to provide you with un-intrusive code. There is a “Thank You.pdf” file included with every file. Please read that file to learn how to use this widget. You can view the live demo of this file by clicking ‘Live Preview’ from above. We also have a video of the file without the watermark available at http://screenr.com/1jg7. On the demo you will see some white text over the buttons. Those are watermarks to prevent people from stealing the content. Sorry for the trouble this may have caused you. This entry was posted in Buttons, Interface Elements and tagged buttons, css, fireworks, icons, media, social, sprites, widget, wordpress on August 15, 2015 by Vera Jaman.